Downtown L.A. has got nothing on Saturn’s moon Titan, at least in terms of smoggy haze that is. 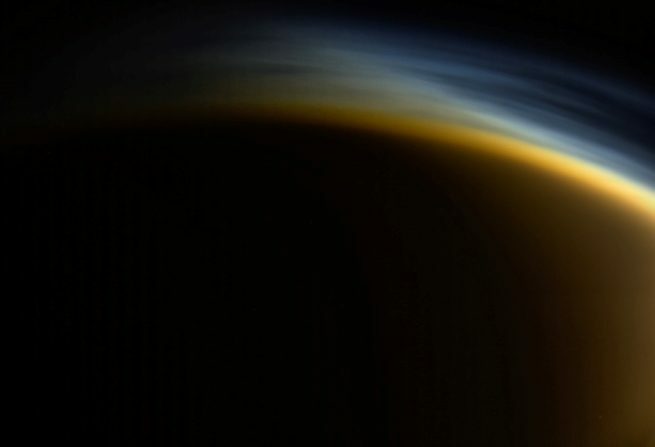 Imagery captured by the Cassini spacecraft prior to its plunge into Saturn’s atmosphere on Sept. 15, 2017 shows a world blanketed in a dense mist. In this image separate and distinct layers of haze can clearly be seen in the upper atmosphere of the only moon in our solar system to have an appreciable atmosphere. Titan is also the ringed planet’s largest natural satellite. Titan is, in some ways, like a young Earth. However, whereas our world (now) has a Nitrogen-Oxygen atmosphere, Titan has a Nitrogen-Methane atmosphere. This natural-color image is how one would see the moon should they be in orbit above the world in a spacecraft and was taken on March 31, 2005. Cassini snapped the picture from an altitude of some 20,556 miles (33,083 kilometers). It was taken looking toward Titan’s north pole from the night side of Titan. A sliver of the moon’s sunlit side can be seen in this image (to the right). No man is an island, and neither are missions into the void between worlds. NASA, the European Space Agency and the Italian Space Agency – all participated on the Cassini mission with NASA’s Jet Propulsion Laboratory managing the mission during its roughly 20 years in space. For its part, NASA / JPL provided a great deal, including Cassini’s two onboard cameras (which were developed and assembled by JPL). The imaging operations center was based at the Space Science Institute in Boulder, Colorado. Until Cassini, little was known about Titan’s surface. The bus-sized spacecraft changed all that. The Huygens probe touched down on Titan’s surface in 2005, providing further details about the mysterious world and in the 12 years afterward the spacecraft completed several passes of the moon, completing its final close look on April 22, 2017.